Hello Everyone! Jennie here from Live the Dream and it is my pleasure to be sharing a project with you today at the Destination Inspiration Booth - the place for Creative Guides to share with you techniques and ideas which will motivate YOUR creative experience. One of my most used dies is the Sewing Room die. 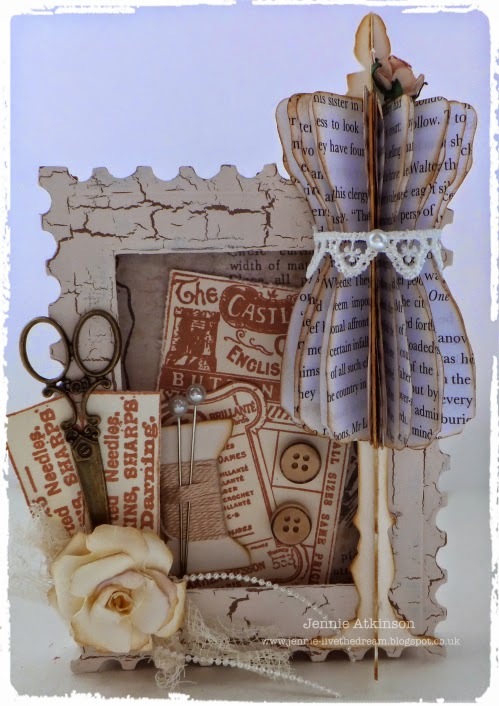 I just love the dress form and use it in so many ways on tags, cards, books and in my scrapbooking. I thought I would share with you today my absolute favourite way of using it - so very effective but VERY easy to achieve! To start you need to die cut the dress form from some reasonable weight board - I have used coaster board here but any mount board or grey board will do. Cut two and leave one complete but cut the other one in half - right down the middle. Blend a little Vintage Photo around the edges. Using a good quality glue which you can run along the outside edge of the piece you cut in half, glue this to the middle of the complete dress form piece. You might have to hold it in place for a while until it dries, but if you use a good glue this should feel quite solid once it is set. Two segments have now been created which can be filled with the paper leaves. And now for the dress - cut ten "dresses" from book paper. I know many of you don't like ripping up old books, but for this project I have used a modern paperback bought from the local charity shop. You could of course stamp your own papers with a text stamp. Again blend Vintage Photo Distress Ink around the edges of the cut dresses - both sides - and fold them in half. Again using a good quality glue run a little glue along the folded edge and glue five pieces into each of the two segments. Start from the outside edges and move inwards so that the last piece you glue is in the middle of the others. I like to put a little bit of lace around the middle and a strategically placed flower at the top hides some of my uneven glueing! And now to make a box to showcase our lovely dress form. I cut another piece for the top of the shadow box using the Postage Stamp Die and cut an aperture using a rectangle die. This top piece was inked with Vintage Photo Distress Ink and once dry I used Paper Artsy Crackle Glaze to give it an "older" texture. I filled the inside of the box with some stamped sewing embellishments before glueing the top in place. This photograph shows how shallow the shadow box actually is. Once the top was in place I added a few more embellishments, including a handmade flower and the fabulous brass scissors. Finally I glued the dress form onto the right hand side of the box. If you are still with me well done! I hope this tutorial inspires you to try this effect and you can find other dies to make something similar. A simple circle die can also be very effective! Jennie - this so lovely and vintage. I love the crackle paint, I seem to forget about it until I see how you have made it look so fab. Thanks for the great DI - I am certainly Inspired! Fabulous tutorial Jennie, you make it so clear and the effect on the dress form looks amazing! I have admired this one before so it's great to know now how you put it together. It looks great on the ball too though, I'm thinking "vintage Christmas decorations"... Great inspiration, thank you! A brilliant tutorial, Jennie - and such an enchanting finished result. I love the book pages, and I think you've probably finally tipped the balance on me pursuing the Postage Stamp too... what a wonderful shadow box it makes! Thanks for sharing your tips, and lots of inspiration. I just love your weathered frame box Jennie - with it's crackled finish - and your technique on the dress form is wonderful! the entire piece is spectacular but I especially like what you did with the dress form! what a wonderful project; thank you for being so detailed; your work's the absolute best!! What a clever shadow box design, Jennie! Great tutorial and that dress from is absolutely wonderful! Love this and all the crackle and sewing room theme! Hugs! A stunning project Jennie. I love all the wonderful details and techniques that you have shown in the DI.